Students march to a Board of Trustees meeting in 2014 to ask Northwestern to divest its endowment funds from the coal industry. After four years of debates, discussion and waiting, Fossil Free Northwestern wants to see concrete action on the University’s divestment from nonrenewable energy. It was 2015, and everything was falling into place for Fossil Free Northwestern. For one, the group had won student support: In a referendum included on the Associated Student Government presidential election ballot, 74 percent of voters said they were in favor of the University’s divesting from coal. And after rounds of revisions and hours of in-group strategizing, Fossil Free Northwestern had finally produced a proposal mandating the University eliminate holdings in coal companies to submit directly to the Board of Trustees. But then their efforts reached a standstill. The Board of Trustees rejected the proposal, sending Fossil Free Northwestern back to the drawing board. The defeat was damaging, Communication senior and member of Fossil Free Northwestern Leo Gallagher said, launching the group into a period of rebuilding and bringing policy to a halt. Now, nearly four years later, the activists are back on their feet, having successfully negotiated new administrative structures to receive feedback and make progress on their goals. But some Northwestern community members are concerned that transparency issues on the part of the University complicate these efforts. After Fossil Free Northwestern’s bid for divestment was rejected in 2015, Gallagher said he, along with other students, entered negotiations with the administration to find a way to move forward and build a more transparent relationship with NU’s Board of Trustees. The result was the creation of the Advisory Committee on Investment Responsibility, composed of students, faculty, staff and alumni, which had its first meeting in May 2017. Melissa Passalacqua, the vice chair of ACIR, said the goal of the committee is to “provide recommendations to the Board of Trustees for investments as needed,” receiving, researching and debating NU community investment proposals. Last week, four Fossil Free Northwestern members presented a proposal at a Tuesday ACIR meeting, calling on the University to divest itself of all holdings in the top 100 coal, oil and gas companies and commit to a plan of green energy investment. The proposal would require the University to nix future investments in fossil fuel extraction and sales companies, create a five-year period for it to phase out existing investments and create a new plan for green energy reinvestment. The proposal — which Gallagher said was submitted to the ACIR in January 2019 — is the first of its kind to be evaluated by the committee. Gallagher said the group reshaped its original proposal to meet the Board of Trustees’ guidelines, answering Board members’ questions about the proposal and responding to feedback communicated in 2015. Now, Fossil Free Northwestern wants to see action. Weinberg senior Carolina Laguna, a member of Fossil Free Northwestern, said she appreciated the new administrative platform for student activists to receive feedback. But she’s concerned the ACIR is failing to act as a “two-way conduit” between the Board of Trustees and Northwestern community members. Despite multiple questions from audience members pushing committee members for a clear action timeline on Fossil Free Northwestern’s proposal at the Feb. 19 meeting, Laguna said it’s still unclear what steps the committee is going to take before it pushes forward with a final recommendation. ACIR secretary Jared Spitz said he “promises” the committee is working as hard as it can to respond to student concerns. He said he hopes the committee will come to a consensus by the end of the academic year, though no guarantees can be made. Weinberg Prof. Jacqueline Stevens, who attended last week’s meeting, criticized members of the ACIR for failing to respond to requests for information regarding the Board of Trustees’ investment process. Laguna said it’s been difficult for Fossil Free Northwestern to get answers from ACIR in the past, and hopes the committee honors its commitment to transparency. “We want to see that this isn’t just another piece of red tape between us and the Board of Trustees,” Gallagher said. Since the proposal’s submission, Laguna said Fossil Free Northwestern has begun working on strengthening advocacy and recruiting more members. She said divestment campaigns have historically been successful when they’ve been backed by strong collective action and mass mobilization of students and community members. Fossil Free Northwestern is hoping to build a similar movement. 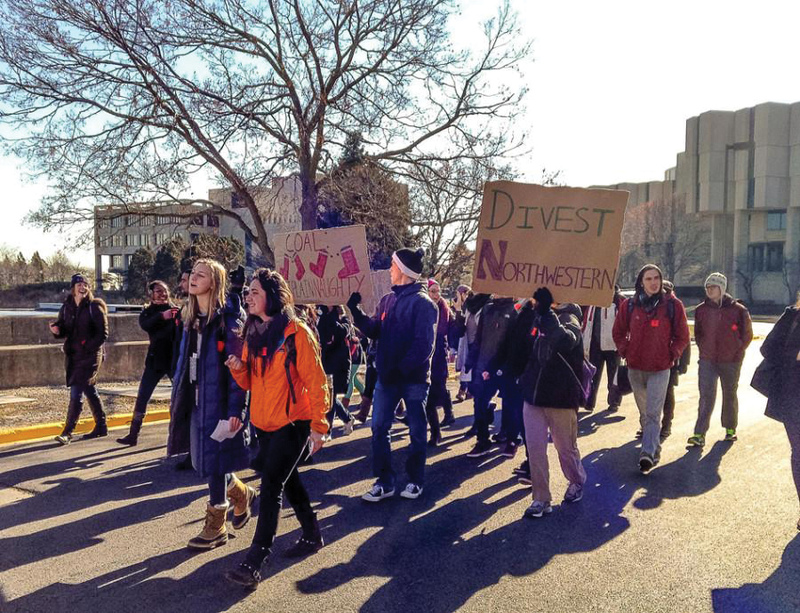 The fight for divestment at Northwestern mirrors a nationwide trend across college campuses. According to Fossil Free Northwestern’s proposal, peer institutions like Stanford University, the University of California system and Yale University have all taken steps to divest themselves of holdings in oil, gas and coal companies. “While there has been a lot of progress as an institution in terms of emissions and our greenness as a campus, climate change is bigger than just this institution; it’s systemic and ingrained in the economic system,” said Audrey DeBruine, a Medill senior and member of Fossil Free Northwestern. But students are worried that by the time their words are heard, it will be too little, too late. DeBruine said she doesn’t have a “lot of faith” in the Board of Trustees, given Fossil Free Northwestern’s previous experiences.